I don't know when in my childhood I first came across the word bazooka, or when I first started slinging everything from broomsticks to didgeridoos over my shoulder in imitation of one. I do remember launching fireworks, bazooka-style, with my brothers using lengths of aluminium piping; I also remember one of those fireworks going through a neighbour's bathroom window while she sat on the toilet. It was Bonfire Night - it could have been anyone (and we didn't hang about to assess the impact of our covert op). 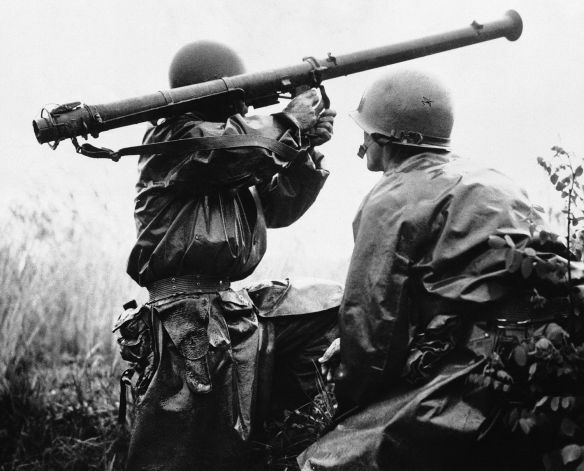 While technically the word bazooka refers to the first missile anti-tank weapons fielded by the US in WWII, it's become a somewhat genericised term for any such shoulder-fired weapons, such as the above pictured RPG-7. Its distinctive profile in any form has made it somewhat similar to the iconic AK-47 in being one of the most recognisable weapon types of the 20th century; someone that knows virtually nothing about modern weapons will still know the word bazooka, what one looks like and what it's for. 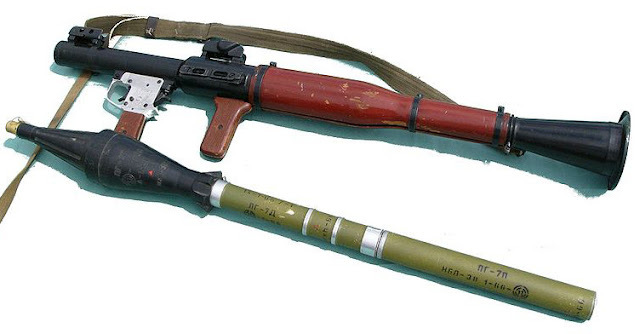 Of course, by the time I reached my mid-teens bazooka (or, more usually, bazookas) had taken on a less rocket-propelled and more mammarian meaning. As of yet, that definition hasn't made it into the OED. Woosh, smash, BANG, ppppprrrpp! Ha! there's an advert for cream at the moment with the slogan "bazooka that verrucca"
I think I first learned of bazookas from the movie Tank with James Garner. It's a particularly American sort of production, with a retiring army man using his restored Sherman to take on a corrupt sheriff. The final showdown features a bazooka being used to shoot off one of the title vehicle's treads. There's also a fairly iconic brand of chewing gum which uses the name. They just announced last year that they're dumping the Bazooka Joe comic strip which uses to be included in the packaging. Quite versatile is the word bazooka, it seems, being used as a name for everything from chewing gum and verruca cream.